Franklin Covey 35419 Classic Planner Refill - Daily - 5.5\" x 8.5\" - January till December - 1 Month Per 2 Page(s) - Green, White - Welcome to TABS! Refill for planners contains dated pages and calendars for planning daily events. Each refill includes a full year of 2-page-per-day planning pages that include Franklin-Covey's Prioritized Daily Task List and Appointment Schedules, two-page-per-month calendar tabs and pages for future planning. Refill includes green and white pages with a straightforward design, comprehensive structure and quotes for daily motivation and inspiration. 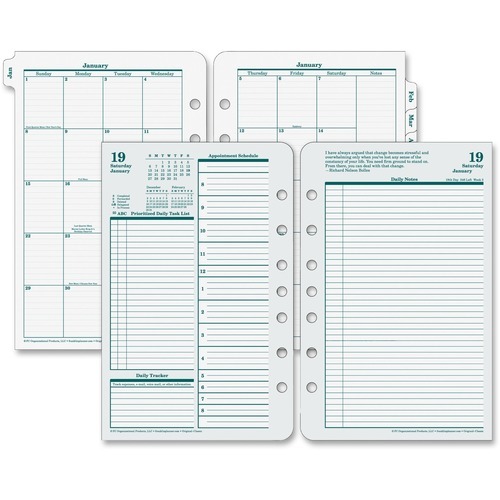 Refill for planners contains dated pages and calendars for planning daily events. Each refill includes a full year of 2-page-per-day planning pages that include Franklin-Covey's Prioritized Daily Task List and Appointment Schedules, two-page-per-month calendar tabs and pages for future planning. Refill includes green and white pages with a straightforward design, comprehensive structure and quotes for daily motivation and inspiration. 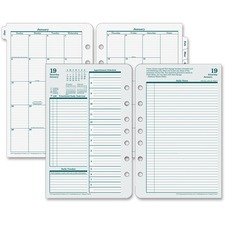 Product Type: Planner Refill Repuesto para agenda Sheet Height: 8.50" 8 1/2"